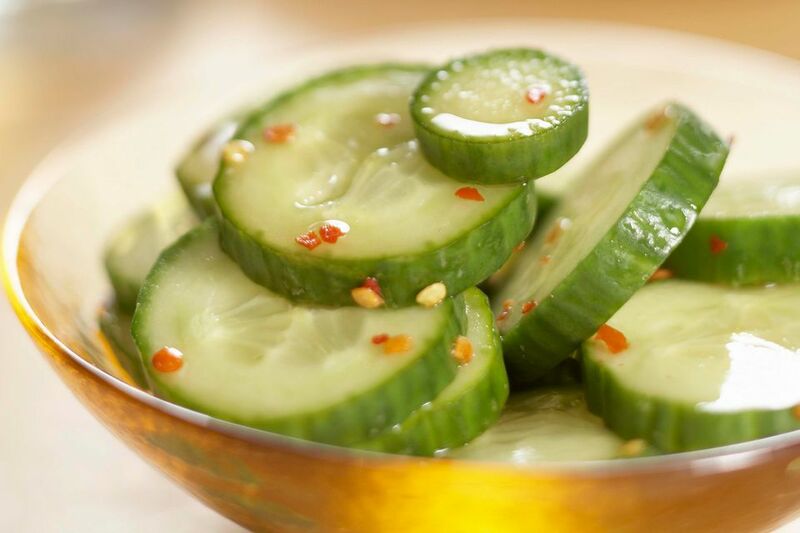 These spicy Korean cucumber pickles are made by tossing crunchy cucumbers with a bit of salt, letting them sit a bit to extract a bunch of water out of them, and then being tossed with a few seasonings. They're ready within an hour or two if you want them that quickly but keep for up to a week covered and chilled (taste their spiciness grow!). They're traditionally served as a ban chan or appetizer with an array of other similar little dishes at Korean meals. We find they work quite nicely in a sandwich, alongside grilled meats, or with scrambled eggs. We've even been known to serve them (with toothpicks, to keep fingers clean) with cocktails, martinis in particular. Use them as you like! Chop the kirby cucumbers into 1/2-inch pieces. If you're using hothouse or English cucumbers, halve them lengthwise and scoop out the seeds before cutting the halves in half lengthwise and then cut them into about 1/2-inch pieces. Put the chopped cucumbers in a colander set over a large bowl. Sprinkle the cucumbers with the salt and toss them gently to combine. Let the cucumbers sit for 30 to 60 minutes. The salt will draw out water from the cucumbers. After they've sat, squeeze them firmly to get even more water out of them. Do this in small handfuls to be the most effective. Lay the cucumber pieces on a clean kitchen towel or rolls of paper towels, and roll up the towels tightly around the single layer of cucumbers to squeeze even more water out of the cucumbers. Put the cucumbers in a medium bowl. Add the garlic, if you're using it, and toss to combine. Add the pepper flakes, rice vinegar, sesame oil, and sugar. Toss everything to combine thoroughly. Add the sesame seeds, if you want to use them, and toss to combine them, too. Cover and chill the pickles for at least 30 to 60 minutes, and up to a week. Know that the longer you keep the pickles, the less crunchy they will become. This method also works with turnips and cauliflower. If you like unusual pickles, you might also like these zuni-style zucchini pickles.